What Happens If I Don’t Close My Pool? We get it. Pool covers on the pool can be ugly and you may be tempted to just leave the pool open. Who wants to go through all those steps anyway? Well, we decided to explore the what if’s associated with not closing your pool. We went to one of our favorite resources intheswim.com. If you have closed your pool already, then I say congratulations and sorry at the same time – congrats for getting it done already and sorry your summer is over. This blog post however, is not about crying for the season passed, but for folks out there with a pool, thinking they might leave their pool open for the winter. You may want to close your pool before the weatherman gives frost warnings in your area – we’re about to show you what happens if you don’t close your pool and have even just occasional winter temperatures below the freezing mark. Fair warning, it’s not pretty. Some of the images might make you break out in a cold sweat and give your wallet and bank account a case of the shivers. So . . .
Q: What happens if I don’t close my pool? There you have it in plain terms. Don’t believe me? I’m not trying to scare you, but there are a whole host of potential damage that could occur to pools – if the pumps aren’t running when temperatures dip below freezing. Let’s move on to specifics. One of the most important things you do when closing a pool is ensuring the pool water level is below the your pool filter system intake along with getting all the water out of your pool equipment and pipes. If there is any water left in the pipes of your pool plumbing, the water will freeze, and Physics 101 class tells us water expands when it freezes, up to 10%, and that’s enough to crack pipes, pumps, filters, heaters, skimmers, and other things – that are full of water. If pool pipes or equipment is only half full of water for example, there may be enough space for the ice to expand into, maybe. But until you’ve done some winterization, your pool equipment and pipes are likely very full of water. If you have an above ground pool with the pool filter system and plumbing above ground (like nearly all above ground pools), pipes and pumps can freeze up in less than an hour of minus 32 degrees. The same is true for inground pool equipment that is not running when temperatures are below freezing. As long as water is moving through all pipes and all equipment, nothing will freeze. Water in underground pipes won’t freeze right away, it takes several days of below freezing temps before the soil freezes. I’ve been told that the frost goes into the ground about an inch per day, when temps remain below 32°, day and night, for long periods of time. Daytime warm-ups can thaw soils just as rapidly, however. As such, it can take a week or two of consecutive days below freezing, before (well-buried) pipes are in danger of freezing. This is what a pool pump looks like when you turn it on after it was damaged by ice. At least PVC pipes and connectors are rather inexpensive and easy to replace. Depending on what type of pool pump you have, buying a new pump housing can cost several hundred dollars more than PVC pipe. To winterize a pool pump (even if just for one night), remove the 2 plugs from the pump. And don’t think your pool heater is stronger. Cast Iron and Polymer heater headers are usually the first thing to snap in a sudden freeze. And it’s fortunate that they do, which drains the heater and avoids much great damage. 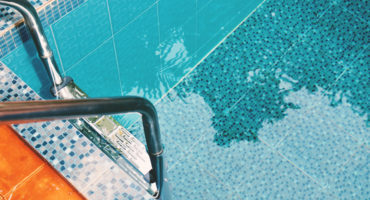 To winterize a pool heater (even for just one night), remove the front and rear header drain plugs, and disconnect the pressure switch inside the heater. Blowing air through the heater is recommended, to remove all of the water. Your pool filter tank can withstand enormous pressure, up to 50 psi in most cases, but that’s still no match for the power of expanding ice. In some cases, the tank itself will crack, or the clamp ring on cartridge or DE filters will crack in half, or the top mounted multiport valve flange will separate from the tank, or just start leaking, as shown here. To winterize a pool filter (even just for one night), open the air bleeder and remove the filter drain cap or drain plug. If you have a multiport valve, turn the handle to a spot in between any two positions, and if you have a push-pull slide valve, place it mid-way between up and down positions. 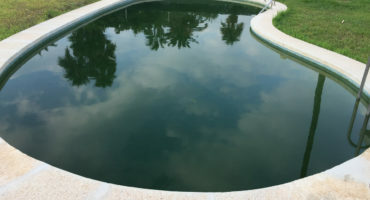 For inground pools, that nasty spring opening surprise could be even worse because your pool pump and filter will start going, and then you’ll notice the equipment isn’t working right and wonder why. It’s because you can’t see the broken pipes that are leaking three feet under your concrete pool deck. Replacing busted up pool plumbing is one thing, having to cut through your concrete pool deck and dig down several feet to fix the plumbing is quite another thing. Let’s not forget, if your pipes are freezing, there’s probably a real good chance your pool equipment is too. If you have an above ground pool, there’s something unique that can happen if you don’t use an air pillow or don’t winterize the skimmer properly, they crumple like tin cans. An above ground pool is designed to contain the water inside of it, but as an ice sheet thickens across the pool, it puts outward stress on the walls. When the ice sheet is also frozen inside the skimmer – any heaving, tilting or slipping of the ice sheet can wreak havoc on even the strongest aboveground pools. In this case, a water leak left no support for a 6″ thick ice sheet. If you are in need of chemicals or a pool cover then look no further than Jay’s Precision Pools! We can’t wait to help you find a solution for your pool closing.